into a sustainable force for good! I want to help you conquer your pain points & become so confident and self-sufficient that I quickly work myself out of a job! 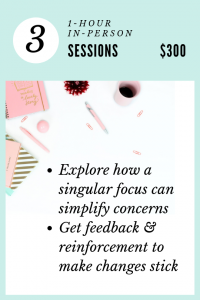 Choose your focus, choose how many 1-hour in-person sessions you can commit to, and let’s get started! Every small business owner’s to do list is longer than what could be accomplished today, this week, or even this month. Sometimes, choosing what to work on any given day can feel more like guessing and luck than intentional progress. We’ll help you determine what to focus on today, to make progress toward your long term goals. The one thing more valuable to a business than money, is time. Whether it’s something small, like your desk, or something larger, like a presentation to potential investors, organization is the key to accomplishing more with what you have. We’ll help you free up time, to reinvest in your core business. Long term, sustainable growth is the goal, but how can you tell if you’re on track? 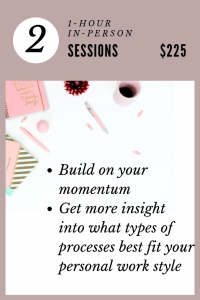 Measuring progress, analyzing what’s working and what’s not, and deciding whether to course correct can be daunting, and can distract from your day to day business. We can help you use the data you already have, to tell if you’re on track to hit your goals, and to help you set new goals as you reach each milestone. "Rachyl eased my mind about the organizational state of my small business. She approaches with ease the daily problems that drive some of us more creative types crazy. I have met very few people with her ability to size up a situation and provide perspective with seemingly minimal effort. It's because she's beaten you to it. For years. If you are tearing your hair out trying to manage your tasks, track your expenses, keep a grip on your goals - contact her. No need to shop around." "If anyone is on top of things, it's Rachyl Kershaw. 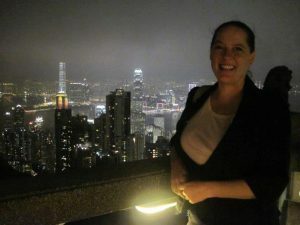 Ms. Kershaw has been working with our not-for-profit organization for approximately 6 months, and has made a huge impact in keeping us and our finances organized, in addition to her work in assisting with our business planning and grant writing. I honestly don't know how we'd have made it through our recent efforts without her." "Rachyl is an analytic thinker and a strategic leader. She has been key in providing advice for starting new businesses as well as performing due diligence for the acquisition of existing businesses. I would trust her as a partner for any business endeavor." "Rachyl's knowledge and consulting have been a valuable asset to this venture. I would not be as confident to my future success without her help. I would highly recommend Rachyl for any consulting needs you may have." "I met at a Meetup networking event and she agreed to meet with me on her own time to discuss some future steps. She has been very helpful in directing my attention to the important things about my business." "She is driven to make sure I succeed as I'm sure she is with all her clients. She takes initiatives and moves on projects without prompting. She is a great consultant to work with." Initial consultation is always free. A clear estimate of pricing will be provided before any paid work begins, in order to ensure no surprises or unexpected costs. Non-profits, B-Corps and other benefit businesses please inquire directly about discounts and pro-bono availability. Small businesses make the world a better place, and the first 18 months are the hardest. 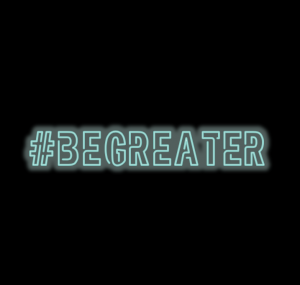 Sometimes, right when you need the most help, you're the least certain you can afford it - that's where #BEGREATER comes in! Tell me about your small business and the impact you hope to make and you may qualify for FREE business consulting! Whether you need help clarifying your focus, figuring out where your time and limited resource will be most impactful, or practical skills training, like how to build a financial forecast, you will become as confident about running your business as you are passionate! Not sure if you would benefit from some help? Use my confidence checklist to get some perspective on how running your business feels today. A client of mine recently received a proposal from a software developer, and asked me to look it over and let her know if I thought it was “ok”. As far as proposals of work from an independent developer go, it was pretty good. It had a long list of bulleted items that would be included, was broken into 4 phases of work, with a separate cost estimate for each phase. The one thing it was missing, at a high level, was a delivery timeline estimate (would phase 1 take a week? a month?). But the first thing I noted, in my feedback to her, was that it was very much written both by and for the developer. I found that it was really good at detailing a bunch of technical tasks I was sure she didn’t specifically request. In some cases, it even detailed some tasks I wasn’t sure she’d actually want performed. Conversely, I recalled several specific features she wanted developed, that I didn’t see listed. To me, that’s not “ok”. Before signing off on any proposal, or any other contract, formal or informal, you should always feel confident that you understand what it says. So what’s a non-technical reader supposed to do? You probably have a good idea what you want, and it’s ok that you do not know every detail involved in creating it, that’s why you’re hiring someone. Being able to spell out what you want may seem easy, but actually this is the bulk of the hard work you’ll need to do. “I need a website” is not sufficient, you need to be very clear about your vision. You need to go into as much detail as you can, and you need to understand any decent developer will likely still have good questions when you’re done. If you get stuck describing, in your own words, what you want, it’s ok to describe it by using examples – as long as you can be specific about what about each example you want (and what you don’t). Ideally, you’ll have written all that down before you ask anyone to bid on the work. That way, when you get back a proposal or estimate, you can look for all the things you asked for. It’s actually a good sign, in my opinion, if the person bidding on the work asks for a copy of your list in electronic format to use to start their proposal. If you don’t see some specific thing you wanted listed anywhere in the final proposal, but you know it was in your list, you’re in a great place to start a conversation about it. Even talking amongst themselves, technical people often say things like, “I don’t see feature X, can you point it out to me?” in a discussion about whether a written proposal truly covers everything. My client was worried that might be offensive to her developer, but it’s nothing to shy away from. Best case, they simply forgot to include it, or summarized the information in a way that wasn’t clear to you. That’s easy to resolve, you just ask them to add it in or make that section clearer. Worst case, they intentionally omitted it, but even that can be a huge positive. If they intentionally omitted it, the reason may be because it’s beyond their skill set, or they disagree with it, or they believe it contradicts something else you requested. Any of those reasons can (and should) lead to a good conversation, and is certainly information you’d rather have now, than after a portion (or all) of the work is complete. No matter how good your list was, how many questions you ask, or how much you ask to be rewritten for clarity, you should not feel bad. Even people whose whole jobs are writing specs (or designing software) forget things, contradict themselves, and ask “obvious” questions from time to time. The end result, and whole point, is a proposal that you feel confident you understand. You should be comfortable you understand what you’re going to get, and the proposed amount of time and expense it will take, just like any other decision you make about your business. If there were only one book I would recommend to business owners, “The One Thing,The Surprisingly Simple Truth Behind Extraordinary Results” is it. This book clearly walks through what focus is, why it is important and how to achieve it in practical terms. As a bonus, it’s a quick read! The specific questions laid out in “The One Thing” aren’t exactly the ones I’ve used through the years, but they are good and the entire approach is so similar to what I’ve found works through the years, that as I read it, it made me wonder if the authors had been inside my office (or mind). I am not a lawyer, accountant, or tax expert. All posts on this site are just my experiences and opinions from doing business, and setting up businesses. Contact us today, to get started accelerating your success!